Caterpillar, the company which supplies the Israeli military with bulldozers, announced that it is delaying the supply of D9 bulldozers during the case brought by the family of Rachel Corrie. 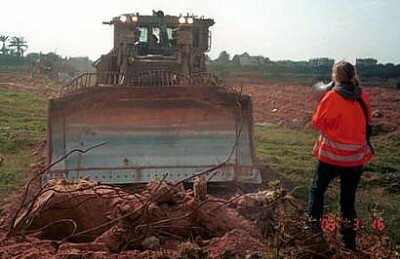 Rachel Corrie was murdered in March 2003, by an Israeli soldier driving a D9. Rachel was part of an International Solidarity Movement (ISM) group attempting to stop the D9 from demolishing a Palestinian home in the Philadelphia Corridor, a strip separating the Gazan part of the city of Rafah from the Egyptian border. By 2004 Israel had demolished 1,218 houses in the corridor. The corridor was extensively bombed during Israel’s assault on Gaza in January 2009.Rachel Corrie’s family have launched a civil suit against the state of Israel over her death. The court, in Haifa, is currently hearing the state’s evidence after hearing the family’s witnesses earlier this year. The two drivers, unlike the family’s witnesses, have given evidence from behind a screen. The Corrie family had requested that they be given dispensation to see the bulldozer driver give evidence, which was refused. The trial is expected to continue into January 2011.